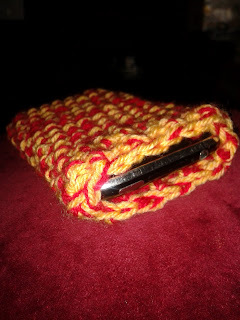 I came up with these patterns after my husband's phone cover fell apart, he wasn't so keen on the idea of a crocheted cover, he thought it wouldn't be very manly. So I decided to prove him wrong and came up with the double colours version below (which he now uses!) Then just because I'm very girly I came up with the single colour version with the flower for me! The use of the Herringbone Half Double Crochet gives both of these covers a real quality feel. Because two colours are used on one and a flower on the front of the other these covers should keep your phone protected from bumps and drops! Both work up very quickly and would make brilliant gifts! 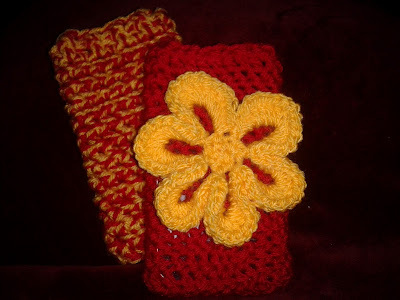 · Front Post Double Crochet (fpdc) – Yo and insert hook from the front to the back around the post of the dc of previous row. Complete as for a regular dc stitch. · Back Post Double Crochet (bpdc) - Yo and insert hook from the back to the front around the post of the dc of previous row. Complete as for a regular dc stitch. Holding two colours together ch22 and join with a sl st to form a ring being careful not to twist the chain. Rounds 2 - 13: Repeat round one around.12 times. Round 14: Ch2, hdc in each st around. Round 15: Ch2, alternate fphdc and bpdc around. Fasten off and hide the ends. 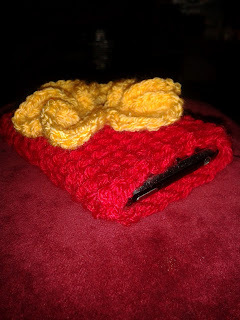 Turn cover inside out and sew up the bottom with yarn and a darning needle, fasten off and hide the ends. Turn rcover ight way around and your done! Using one colour only ch19, join with a sl st to form a ring being careful not to twist the chain. Rounds 2 - 16: Repeat round one around.15 times. Round 17: Ch2, hdc in each st around. Round 18: Ch2, alternate fphdc and bpdc around. Turn cover inside out and sew up the bottom with yarn and a darning needle, fasten off and hide the ends. Turn cover right way around and your done! Ch2, 5 hdc into first ch on hook, join with a sl st to form a circle. Round 2: [Sc, 2 hdc, 5 dc, ch 1, 5 dc, 2 hdc, sc] around first ch 8 sp * [sc, 2 hdc, 5 dc, ch 1, 5 dc, 2 hdc, sc] in next ch 8 sp, rep from * around, join with sl st in first sc. Fasten off (6 petals). I hope you like this pattern! If you have any problems with it please don't hesitate to let me know and I'll see if I can help! Crocodile Stitch Newborn Baby Cocoon!